Flexion-Distraction is a therapeutic technique used to treat people with a variety of pain syndromes that have not responded to other treatment approaches. It is a gentle, chiropractic treatment procedure utilized for spinal pain, back and neck pain, arm and leg pain. Flexion-Distraction is a safe alternative to back surgery for those 95% of patients whose conditions do not demand surgical intervention. The doctor is in control of the treatment movements at all times. 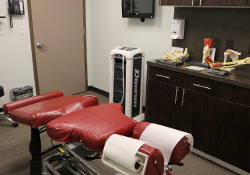 The flexion-distraction adjustive procedure is performed on a uniquely designed table that is enhanced and developed by James M. Cox, DC, DACBR, and is based on a distractive force (supplied with the contact hand) combined with table motion. Flexion-Distraction technique uses the Cox table to restore normal physiological range of motion to the cervical, thoracic and lumbar spinal joints. Flexion-distraction manipulation is a gentle, non-force adjusting procedure which works with the body's natural design to aid it in healing properly. Dr. Robert Silverman has been an integral part of my success this past year. Because he is an expert in so many different techniques, I received the best treatment possible. He has also helped me gain the edge through proper nutrition and supplementation. Additional goals of the flexion-distraction adjustment include transfer of metabolites into the spinal disc, decreasing intradiscal pressures and decompressing inflamed/compressed spinal nerve roots. In short, it reduces the pressure within the spinal discs.